Red symbolizes vitality, courage, optimism, anger, impatience, nonconformity, passion. These are just a few values ​​attributed to a color so representative of the human condition. I think they reflect perfectly part of Carlota’s soul. Carlota (Charlotte) is a stranger, as they like to call the outsiders in those homes, who a few years ago moved to live in Fermoselle, a town Zamorano belonging to the region of Sayago, and nestled within the natural park of Arribes del Duero . Worked and traveled through France, Italy and South Africa to learn from the best winemakers to later practice as a winemaker in several wineries. One day he trod this region on the recommendation of a friend, and for things of fate and his restless soul, he moved to live and work in this land. Difficult ground. Especially to take care of your grapes under the “madness” of biodynamics and natural treatments. 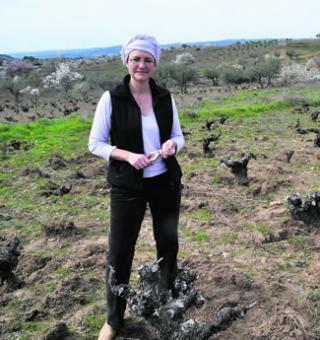 I think I can say, if she allows me to, that Carlota fell in love with some vineyards nestled in a lost, rugged and difficult place on the map of the province of Zamora. Away from everything, but much closer to the earth and its feel. It established a direct connection with a place almost forgotten. A hard land for a woman to work on, not for her lack of courage and courage, but for those rural looks of contempt for her work. To feel observed and examined, at all times, by the ignorance and distrust that is generated in the towns and their people towards an outsider. For that Spain so our, the typical deep Spain, the usual Berlangian Spain that will never change. However, its wines do not reflect the hardness of this land, the harshness of the climate and its people. The wines of Almaroja or the red soul of Carlota, are revealed delicate and subtle. Armed with layers very different, complex and friendly at the same time. They reflect the countryside at its most beautiful stage, the spring and its sun at half height. They show the flowers and the insects that flutter around, the honey. They show the flavors that an old vineyard can paint on a wine if it is treated correctly. They depict the rural bounties of a land almost forgotten from our map, lost in the Iberian confines, located in the distant Spanish West. Yellow straw, golden. Nice color, clean. White flowers and stone fruits. Lots of intensity, honey and maybe some anise. Very mineral, and very well done. Fruits and high volume, glycerol. Persistent and long. A marvel of white, do not pass this life without trying. It’s a really curious red. Different. Chestnut red, high layer and purple trim. At first it shows closed, some glue. But then it opens towards the field, towards the flowers and toward the violets. Red fruits, forest fruits and potent balsams. Mineral background and very correct acidity. It drinks easy, so be careful. It is a complex wine, but enjoy. And if we give it time, we will discover several faces, which more interesting. Powerful, structured and complex. Red cherry, medium / high layer. Ribete still alive and with little oxidation. In the nose intense, elegant, resounding. Black fruit, and many balsamic to browse. Do not be in a hurry with this wine, letting it be a quiet time oxygenating you will enjoy it more. Good acidity, powerful, sweet tannins and great minerality. Much volume and travel. Very big. I am happy to write this entry for Esther, my nephews and for the wonderful trip we made to the Arribes del Duero. A wonderful place to visit, which gives you all the beauty of nature’s wilderness. We spent a few wonderful days, discovering a wonderful land, barely tamed by the man’s hand. I am also happy to write this for Carlota, someone with whom I incurred a debt and with this text I understand that I only balance half.